How is your businesses’ marketing research? Marketing research is important to any business--big or small! Marketing research helps with insights and information about current and potential customers; providing information that is timely, accurate and objective. It helps eliminate the “guessing” when it comes to effectively marketing, understanding customers and evaluating business decisions. However, marketing research is only valuable if it is conducted properly! Primary research really just means getting first-hand inputs from people. It may sounds time consuming and costly, but it doesn’t have to be in order to be valuable! Primary research is important because it provides you with direct feedback from potential buyers and target markets. Not sure who to contact? First, define your target market, who is your customer? What is their age, gender, income? The US Census Bureau is a great FREE resource when it comes to finding basic demographics of populations, incomes and more! Today, many third party survey services can help you find people to interview at a low cost, if you don’t want to do the field work yourself. Now when it comes to how many people should I consider interviewing? Remember, “quality over quantity” is best when it comes to interviews. They can be informal or formal, whatever works best for your business and goals! It’s important to get fewer quality interview responses opposed to a lot of rushed incomplete responses. Start the interviews off with some small talk, then determine whether or not they qualify with some “screening” questions, then determine if their responses will be valuable. But, how many should you send out? 50-100 is usually a good number of responses from a randomized sample to get a feel for answers, but that is up to you and your research goals. Tip 1: Keep the group size between 6-12 participants to ensure control and quality! In focus groups, it’s VERY important to stay on task and in control! All focus groups should have a moderator, assistant moderator, technician (in case there are any technical problems) and an observer. Why include those who do not qualify? Make sure the participants are representative of your target market! Tip 3: Ask open ended questions, but don’t drill them with questions! Have a discussion! Don’t ask questions that have simply “yes or no” answers, have a conversation, and keep it natural! Make sure you have an agenda to stay focused and on task. Tip 4: ALWAYS include a debrief! Wrap it up! Reflect with your participants what was all discussed and thank them! Focus groups shouldn't be longer than an hour at most. If needed, you can provide your participants with breaks. Secondary research is simply looking and evaluating previous research that’s already been published by someone else. It can help businesses understand competitors, establish benchmarks and determine target market(s). Best of all, it’s low (if an) cost! Sounds easy? It is! But……. One pitfall to keep in mind: make sure what you’re evaluating comes from a reliable and trustworthy source! Tip 1: Is the source accredited? Make sure those who conducted the research are qualified. Find resources that are noteworthy and published by reliable sources. Tip 2: Read the fine print! AKA make sure you know what you are reading! Quantitative Data utilizes statistical and mathematical reasoning and analysis. This helps provide important statistics and “numbers” to help companies look at their gains, losses and much more. In terms of numbers, look for populations sizes, sales, etc. Charts can be generated from quantitative data which can help in visualizing your findings. Qualitative Data helps businesses understand customer feelings, perceptions, attitudes and values. Look at habits, ages, locations, members, etc. 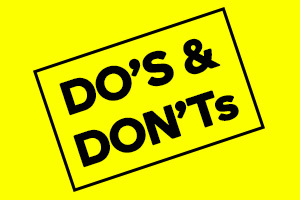 Now that you understand what “to do,” it is good to know what “not to do” in conducting marketing research for your business. While secondary research is very valuable, it is very important to incorporate and conduct primary research; after all, it is your business! Remember, what is right for one business is not always right for yours! The Internet can be a very useful resource; however it is not the “end all!” For example, online survey respondents are not always truthful, and information may be missing or not reliable. Performing and conducting your own research is extremely important in order to better understand your target market and more. Step outside of the “convenient zone!” As easy and inexpensive as it may seem to use your personal network for research inputs, you may not get the best information….biases can occur when you talk to people you already know and the information may not be honest. Going outside of your “convenient zone” aka the people you already know, will help provide your business with new insights to evaluate your current/previous marketing plan and learn more about your market first hand. In today’s business world conducting marketing research is extremely important! Being proactive, continuous learning and staying current will help your business succeed!